SAACMA is proud to be a member of WFCMS. As an international non-profit academic organization, WFCMS is mainly composed of volunteer groups, institutions and ethnic medical groups, whose domains are Chinese medicine and pharmacy as well as the integration of Chinese medicine and Western medicine in the countries (regions) all over the world. 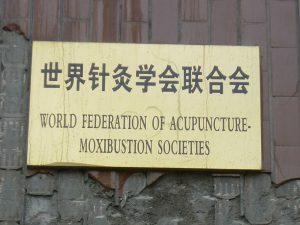 WFCMS strives to promote the exchange and cooperation among Chinese Medicine societies as well as the cooperation between Chinese Medicine and other medicines of the world; to promote the professional level of medical practitioners of Chinese Medicine by strengthening academic exchanges, information dissemination, and achievement exchanges; to bring Chinese Medicine and Pharmacy into health care systems of other countries by accelerating the process of modernization, internationalization and standardization of Chinese Medicine, which offers a greater contribution to the health of the mankind. The WFCMS head office is based in Beijing, China. In April 2017 SAACMA became a members of WFAS. WFAS is an association that gathers experts from the academia, education and medical societies in the world; it is an international, non-governmental acupuncture organisation (NGO) in official relations with the United Nations World Health Organization (WHO). Their goal is to establish international recognition and standards of acupuncture in the medical community, offer protection for human health and save lives, as well as collect forces around the world to strengthen acupuncture research, maintain the quality and reputation of acupuncture education and medical principles.